Allan Pogue's work has cast him as a trick trainer - but the word "trick" does not even scratch the surface and seems to diminish the value to me. What he accomplishes for the horse is so much more than tricks. We've just recently discovered Allen, and we're dumbfounded by how his horses treat him, and try for him. And Have fun doing so. Joe Camp in "The Soul of a Horse"
Imagine A Horse is a fresh and innovative lifestyle that focuses on the horse as a companion and friend in sport, at home and in the field. It's innovative horsemanship at its best. 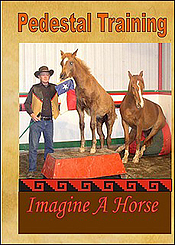 Imagine A Horse training categories include Enhanced Foal Training, Enlightened Trick Training and Circensic Dressage. The logic and structure of the lessons is easy for the horse to understand. Horse and Human participants learn to build a relationship through understanding each other as individuals while still maintaining the proper herd hierarchy. 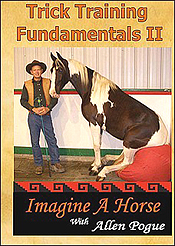 Imagine A Horse methods can be applied to horses of all ages, breeds and training disciplines. Perhaps the compelling aspect of this method is that the horse learns how to learn. Learning to perform the Spanish Walk becomes fun for your horse. We like to refer to our methods as Equine Agility for the horse's mind and body. Just Imagine! We dare you to. 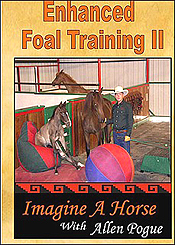 Enhanced Foal Training helps to instill correct behavior in the horse from the very beginning. Enhanced Foal Training is a methodology for bringing up young horses to be honest, highly intelligent and most importantly, adaptable. Enhanced Foal Training begins shortly after birth in conjunction with traditional imprinting because foals are ready, willing and able to learn shortly after birth. Enhanced Foal Training includes non-stressful exercises and challenges that are fun and infuses trust while creating a lasting bond between foal and handler. Additionally the logic of the method teaches a foal 'to learn how to learn' while it promotes skills and respect that are easily transferred to a foal's "higher education" requirements upon maturity. With Enhanced Foal Training, foals begin to learn a life long work ethic that applies to independent work and schooling in unison with foals and other adult horses. Trick Training - Calculated to create an equine companion. Trick Training can be used in horses of all ages to help encourage communication, to perfect obedience, and it's just plain FUN for the horse and the handler. 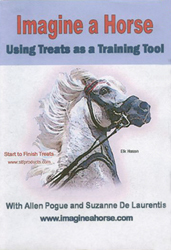 Trick Training helps the horse to make sense of the world of humans by creating useful cognitive skills. Horses seem to trulyl enjoy the challenges of Trick Training. Individual behaviors when linked together create a behavior chain with each movement logically following the next. Performance is not left to the subjectivity of a judge. You and your horse both know when you have completed the steps. Trick training helps a handler to spark the horse's willingness to engage thus fostering the development of intelligence. Circensic Dressage - The art and science of training the exhibition horse and rider. 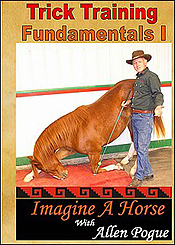 The concept of Circensic Dressage is brought to life in Allen Pogue's unique Imagine A Horse presentations. A program of beautiful horses performing above and beyond the ordinary by combining seldom seen tricks with the spectacular gaits of circus-style Haute Ecole. 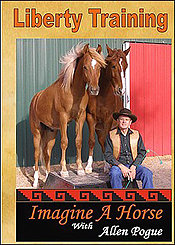 Imagine A Horse performances include a Liberty presentation with Tricks in-hand and a classical long rein presentation. Hasan executes a Hind Leg Walk, Spanish Walk, Levade, Piaffe, Courbette and other seldom seen high school movements to rock and roll music. Enhanced Foal Training is used in conjunction with traditional imprinting and includes non creative challenges and exercises that are fun and help to infuse trust in the very young foal. Foals learn how to learn. 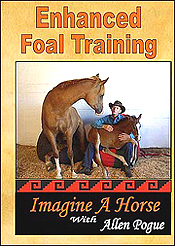 EFT promotes skills and respect that are easily transferred to a foal's higher education upon maturity. Demonstrates early learning sequences with 3 foals and 2 adolescents. Enhanced Foal Training II shows new methods and information to expand the possibilities for educating a new foal. Activities are age appropriate and calculated to create a thinking horse. Enhanced Foal Training II showcases two graduate young horses acting as assistants while Allen trains a two-week-old Andalusian filly. Trick Training Fundamentals I shows how to teach The Bow, Kneel and Obeisance. Detailed instructions using both young colts and adult horses for demonstration purposes. Trick Training Fundamentals II details how to continue after Fundamentals I and teach the Lay Down, the Sit Up and then the Sit Down. Emphasis is on handler safety, and comfort for the horse with Humane techniques. Shaping Behaviors I shows how to shape the smallest try into a gradual approximation and then the finished tricks. The techniques shown here can be used for a variety of other behaviors. It is all about learning the techniques then creatively applying them to different situations. Liberty Training has detailed instructions that begin with one young horse and proceeds to a multi-horse circus style Sorting Routine. 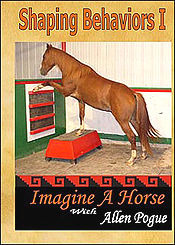 This DVD video is detailing the use of Pedestals in a Trick horse's complete education and performance. Why pedestals work to create a bolder yet more compliant horse. With an introduction to the lost art of the Liberty Pole - New Release! Allen takes four different horses through the steps in training the majestic Spanish Walk. Along the way he demonstrates the use of a single pillar or Liberty Pole. This is a training tool that dates far back into antiquity but precious little about this method has ever been documented and shared. 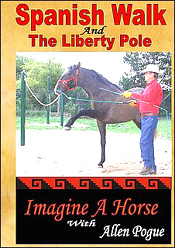 The term Liberty Pole is one Allen has coined because it presents a way for a horse to earn the right to perform free of restraint. All DVDs are approximately 60 minutes. All are priced at $23.75 each plus s/h. To buy just click on the "purchase on-line" button for the DVD you choose. After you made the first purchase in the shopping cart, use the "continue buying" button to return here for more great DVDs.